Music therapy could be the most effective way of helping people with Alzheimer's disease or other kinds of dementia to manage their symptoms, research suggests. Scientists at Anglia Ruskin University in Cambridge observed improvements to the symptoms and well-being of patients, as well as a reduction in disruptiveness to staff at their care home, in a five-month study. They claim music appears to be able to reach parts of the damaged brain in ways other forms of communication cannot. 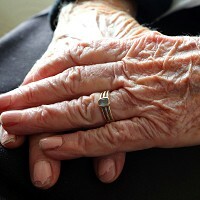 Patients with some form of dementia at two Methodist Homes in Derby were split into two groups. Those in the intervention group received one to one music therapy once a week, in addition to standard care, over a period of five months. Those in the control group did not participate in music therapy. Participants in the intervention group showed improvements in their dementia symptoms, measured using neuropsychiatric inventory scores, and well-being, measured using Dementia Care Mapping scores. There was also a decline in occupational disruptiveness to staff, both in terms of their work routine and emotional impact. Results were even sustained after the trial ended, with measurements taken two months later showing continued improvement. But the same cannot be said of the control group. Participants showed a decline in all three areas during the course of the trial, plus in the subsequent two months, suggesting music therapy facilitates positive change. Carers in the homes were encouraged to use some of the music therapy techniques with the residents afterwards. They also reported similar beneficial effects to the study, particularly when it came to mood and emotion. Communication, memory, agitation, apathy and anxiety all showed signs of improvement as well. Living with Alzheimer's disease can be extremely difficult, both for the person affected, and family and friends. But it does not mean a person and their loved ones cannot enjoy the finer things in life, like going on holiday. Alzheimer's travel insurance gives the peace of mind needed to relax on getaways around the world. The new study was published online in the journal BMC Geriatrics.